It's no secret that I'm a huge fan of scents, and incorporating them into my space is an element of interiors that I feel really turns a house into a home. 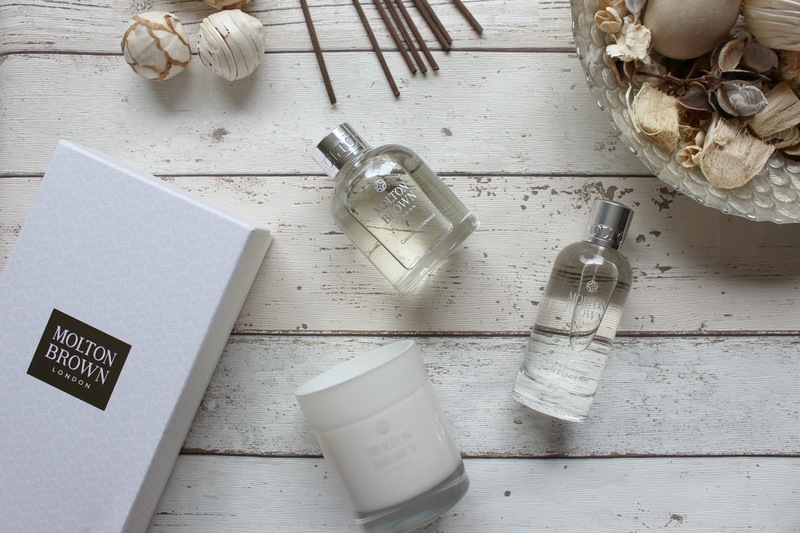 It's such a joy to discover a new fragrance that you fall totally in love with, and that's exactly what happened with the Molton Brown Coco & Sandalwood collection. Coconut is the ultimate holiday scent for me and I think that's the reason why I find this particular blend so gorgeously relaxing; even if the skies are grey and rain is lashing at the window in classic British fashion I need only close my eyes and breathe in to feel like I'm on a private island looking up at palm trees, surrounded by turquoise waters with a piña colada in hand. It really is that good! I can't sum it up quite as beautifully as Molton Brown can, so here's their description: "Fresh top notes of creamy Filipino coconut, milk and spicy-sweet cinnamon melt flawlessly into a heart of honeyed jasmine, cedarwood and copahu; comforting sandalwood, guaiac wood and vetiver blend for rounded, subtle depth". Believe me, it smells just as good as it sounds and having my home this beautifully scented is just dreamy. My favourite item of the collection so far is the Coco & Sandalwood Aroma Reeds - I find reed diffusers are so efficient in their ability to fragrance an entire floor of your home without being overpowering, and you get the added bonus of not having to worry about whether you definitely blew that candle on your dressing table out. Let's face it though, we all know I love a good candle and there are two stunningly packaged ones in this range; Single Wick and Three Wick. I also adore the Home & Linen Mist as I can't express how much I love this fragrance, and having my sheets infused with it makes me one happy lady! Next on my list are the body products, notably the Body Wash and the Nourishing Body Lotion so I can make myself smell like paradise - and I can imagine getting a lot of use out of the Replenishing Hand Cream whether it be on my bedside table or in my handbag. These three items also come in a Gift Set if you fancied treating a loved one to a pamper.